On December 4, I was thrilled to have the opportunity to attend the National Christmas Tree Lighting Ceremony at the President’s Park in Washington, D.C. Through Google’s Made with Code program, girls like me had the opportunity, for the first time in history, to code the lights that appear on the 56 state and territory trees in front of the White House. At the event, it was fascinating to see all the beautiful, sparkling lights in person. I also couldn’t believe how close we were to President Obama and the First Family. This is one of the most memorable experiences I’ve ever had! 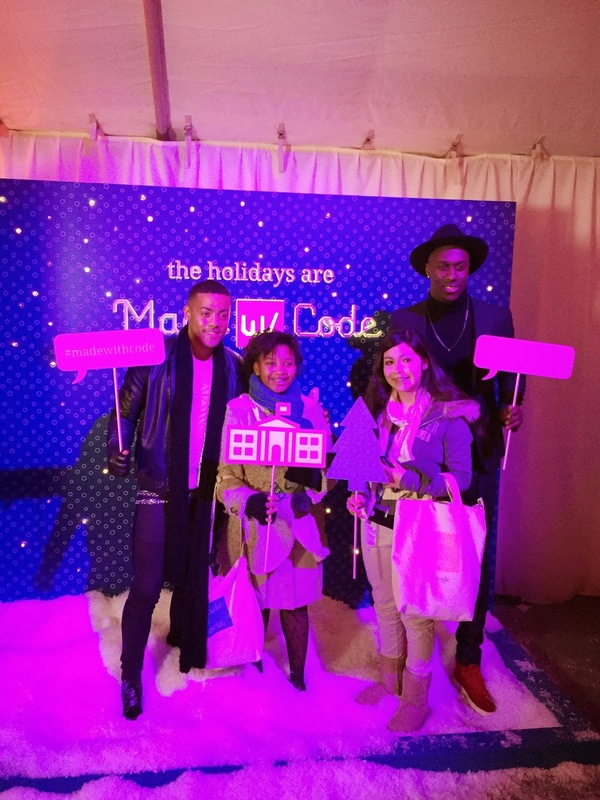 Before the event, I made sure to check out the Made with Code website. Although I had not tried coding before, I know how important of a skill it is. When I attended the Virginia Girls Summit, held annually at George Mason University, one of the exhibitors told me, “Everyone needs to take a class about coding. It will help you prepare for the future.” The world around us is changing and us girls need to be as prepared for the job market as we can. On the Made with Code site, I ended up trying all three activities: coding a Christmas tree, monster and snow flake. I had a lot of fun, making each image my own by changing the code specifications and then seeing my image become animated. I think my mom, who tried the activities with me, had just as much fun on the website as I did! Everything at the President’s Park was so elegant, which set the stage for the rest of the program. It was so thrilling to see Tom Hanks, the host for the concert, along with all the other amazing artists. The best part of the program was seeing President Obama dance with all the singers and Santa at the end of the concert! After it ended, I had the opportunity to attend the Made with Code reception. Everything was so surreal during the reception because me and my Girl Scout buddy had a chance to meet some of the celebrities, including Fifth Harmony, Afro-Norwegian singing/songwriting duo Nico and Vinz, and singer Ne-Yo. After my experience, I was encouraged to try an Hour of Code with the website Khan Academy. I am grateful to Google and Girl Scouts for providing me with this amazing, once-in-a-lifetime opportunity!